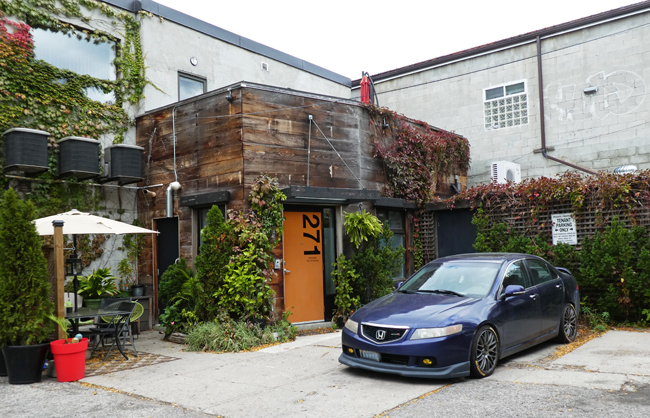 I was wandering down a laneway behind Dundas St W way out from downtown when I spotted this little funky oasis. It just shows you that you can make your own little getaway spot anywhere. That is a small deck up behind the wooden wall. All of this is behind just a regular commercial building. It looks cute, it is like a tiny house? Happy Thursday, enjoy your day! Have a great weekend! You can just do that?! It's like a little oasis of calm. Great find! Precioso adorno natural. Bonita fachada Pat. ...neat, but how many millions? A nice wee spot to go to, I love it! That is very nice. At first I thought it was an addition to a housing unit. Perhaps it's a getaway for folks who work in the building. Well spotted, Pat. I thought it was a house too. I hope it gets the sunshine. A nice spot to relax. What an odd little building made from recycled wood. Looks like someone likes hanging out here. Good find. It's been there a while if the plants are any indication. It truly does seem to be a little oasis. Looks very cute, and the garden is well tended. Very nice indeed and that in the concrete jungle.